Tourta Fraoulita is a 100% homemade Strawberry Cake I made from scratch to celebrate my husband’s name day. 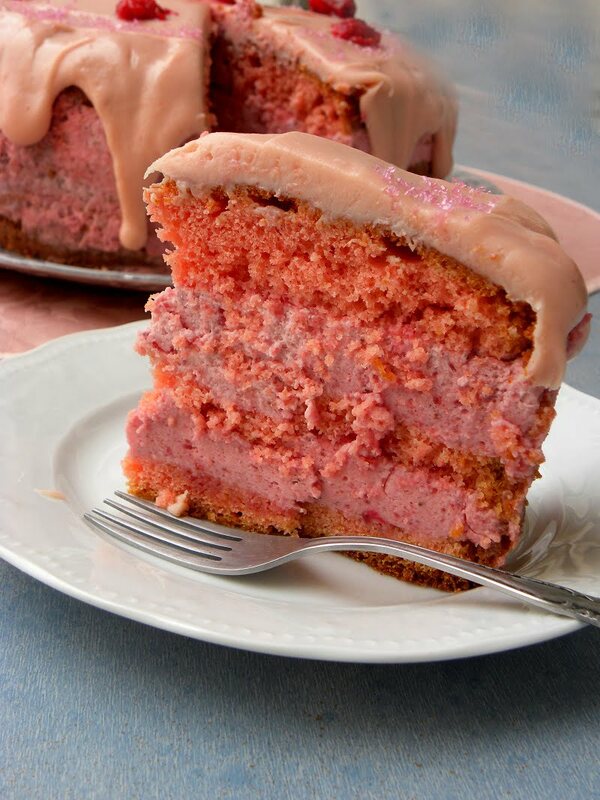 I made the cake based on the Luscious Bounty Cake, which again was based on my Marbled cake, but this time in the batter I addedd some strawberry syrup as well as 2 drops of red food colour, to make it pink. The result was a tall, moist strawberry cake, which was cut into three slices and in between a light in texture, strawberry mousse, topped with a white chocolate, cream cheese, strawberry frosting, which makes it extra fluffy and delicious! As this cake is quite original, I wanted to give it a unique name. I rejected the name Strawberry Cake, as it is very common with thousands of recipes. Since the cake is all about strawberries, I decided to use the Greek name for strawberries which is Fraoula (singular), so I used the word “fraoulita” as an adjective of the word. I named it “Tourta Fraoulita” which in Greek means Strawberry Cake! I didn’t want to use the name “fraoulitsa” as this is the diminutive of the word strawberry, which is not the case here. A week ago we left Asini for our winter stay in Athens. As usual, I emptied and cleaned the deep freezer. I stocked a lot of its content in the fridge’s freezer but there were still many things left behind, which we brought along with us to Athens. Surprise, surprise! In the deep freezer I found a Tupperware bowl full of strawberries. 800 grams of delicious, juicy rubbies, waiting for me to be used in a dessert. I used all of them in this cake! Since my husband’s name day was a couple of days after we came here, I decided to use them and make this Strawberry Cake. I planned everything ahead, visualizing a yellow sponge cake, which eventually became pink, a pink cream made with Greek yoghurt and whipped creaam and Strawberry Sauce, thickened with gelatine, similar to a Greek Yoghurt and Pomegranate Mousse I made many years ago for the filling and a white chocolate frosting or ganache on top, which, eventually, again became pink. I made the strawberry sauce first as I wanted it to cool and take some of the syrup, in order to use it in the cake. Make sure to read the steps and reserve the amount of syrup to be used in the various stages. You can of course use fresh strawberries but if you like, you can reserve some of the frozen strawberries for decoration. The next day I made the cream filling. When using gelatine, it has to soak in tap water first to soften and then it needs something hot in order to dissolve it. I could have used some of the heavy cream to do this, but I decided to use the syrup in order to dissolve the gelatine. I also used some of the syrup to wet the sponge, as well as in the frosting. While I was beating the butter with the sugar to make the cake, I decided to add some strawberry syrup in it, first of all to get more strawberry flavour in the cake but also to give it a pinkish colour. The syrup made it slightly pink, but not pink enough, so I also added 2 drops of red food colour as well. You can add more if you want a darker shade of pink but since I am not very fond on using food colour in my recipes, I was satisfied with the outcome and left it as it was. I puréed the leftover strawberries with a hand blender in which I added the strawberry syrup with the gelatine and let it cool completely. I then whipped the cream until it formed stiff peaks. Then I added the Greek yoghurt and the strawberries. White chocolate is quite sweet so it was not necessary to add any additional sugar. I tasted the cream and the outcome was sweet enough for my taste. If you don’t think it is sweet enough for your taste, I would suggest adding some icing sugar or some honey, mix, taste and adjust until you get the perfect sweetness. However, the amount I used was perfect for my family’s taste. The strawberries I saved in the deep freezer were quite sweet so if you are using fresh strawberries at the beginning of spring, when they are on the tart side, you must increase the amount of sugar. Since I used frozen strawberries, they had ice on them, so I did not add any water. If you are using fresh strawberries, just wash them and use them when they are still wet. If they are dry, you must add some water, about 1/4 cup, to wet the sugar, so that it melts easily. I was planning to add a white chocolate ganache on top but since there was some cream cheese in the fridge, I decided to make a frosting instead. Again, I used some of the strawberry syrup, in order to make it pink as well. The whole procedure takes about two days, considering the time needed for some of the stages to cool but if you start early in the morning you might have the cake ready by the evening, so as to eat it the next day. In order to speed up the procedure of cooling something, here is a trick I am doing during my cooking classes. Some desserts must cool before cutting them in order for the cream to set. For this reason, I prepare an ice bath to speed up the procedure. I use a bigger baking pan in which I add some ice cubes and some water and put in a pot another baking pan (not with a spring form base). Otherwise it will take ages for a dessert to cool naturally, especially during summer. I made the frosting the third day, not because I did not have the time but only because I wanted to take the pictures with natural lighting. It may look like a lot of work to do for a single cake but the whole procedure is not as difficult as it looks. Just organize your time and have some patience. Don’t forget that the most important ingredient to achieve what you are doing, is to add a dose of LOVE in it! ⇒ The strawberry sauce can be made ahead and kept in the fridge for 4 – 5 days. ⇒ The cake can also be made 3 – 4 days ahead and when it cools, keep it in the fridge wrapped with cling film. ⇒ The final stage of assembling the cake can be made in a couple of hours. The outcome is a delicious cake full of strawberry aroma. The cake was moist and fluffy, the filling was light and airy and the frosting was perfectly sweet. Everyone loved it! Prepare the cake and the strawberry sauce, preferably from the previous day. For the Strawberry Sauce: Reserve one or more strawberries for the final decoration. If frozen, keep it in the freezer. Cut the remaining strawberries into smaller pieces, add the sugar and cook for fifteen minutes, mixing every now and then. Remove from the heat and set aside to cool. For the cake: You can watch the video from the previous recipe before making the cake. Preheat the oven to 180C/ 350 F and place rack in the centre of the oven. Line a 24 cm spring form cake pan with parchment paper and grease and dust the sides of the pan with flour. Combine the flour, corn flour, baking powder, baking soda and pass them from a sieve. Add the salt and lemon zest and mix. Whisk the egg whites with the lemon juice, until you get a stiff meringue. In the bowl of your electric mixer beat the butter with sugar until light and fluffy. Add the eggs, one at a time, until incorporated. Add the strawberry syrup, vanilla and food colouring and mix. Next day: Drain the strawberries and reserve most of its syrup to use it to wet the sponge, to dissolve the gelatine and to make the frosting. Cut the cake into 3 slices and wet each slice with 2 – 3 tbsp strawberry syrup, (about 1/3 cup). Reserve some of the strawberry syrup (1/4 cup) for the glaze and heat the remaining syrup. Mix in the gelatine and set aside until it cools. Prepare the filling: Reserve a tbsp heavy cream to use in the frosting and whip the remaining heavy cream until stiff peaks form. Add the yoghurt and mix until incorporated. Refrigerate until ready to use. Purée the strawberries using a hand blender. Mix in the strawberry syrup with the gelatine as well as the whipped cream and yoghurt. To Assemble: Wet the three pieces of cake with strawberry syrup. Remove the parchment paper from the first piece of cake and place it in a platter. Attach the ring of the pan around it and make sure to close it. Add half of the strawberry cream. Then add the second piece of cake and cover it with the remaining cream. Top with the third piece and refrigerate for at least 4 – 5 hours. Frosting: Melt the chocolate over a double boiler. Remove from the heat and with a spoon mix every now and then until lukewarm. Mix in some cream cheese and some strawberry syrup and mix to combine. Add more cream cheese and syrup and using the hand mixer mix for 2 – 3 minutes for any lumps to dissolve. Add 1 drop red food colour if you want a more vivid coloured frosting. Remove the cake ring and pour the strawberry frosting on top. Using a spatula push it along the side to make dripping effects. Sprinkle with pink sugar crystals and decorate with a raw strawberry in the middle and some cooked strawberries around the edge. Refrigerate for an hour for the frosting to set. Tourta Fraoulita is a 100% homemade Strawberry Cake filled with strawberry yoghurt mousse and topped with strawberry white chocolate frosting, which I made from scratch to celebrate my husband's name day. Reserve one or more strawberries for the final decoration. If frozen, keep it in the freezer. Cut the remaining strawberries into smaller pieces, add the sugar and cook for fifteen minutes, mixing every now and then. Remove from the heat and set aside to cool. For the cake: You can watch the video from the previous recipe before making the cake. Whisk the egg whites with the lemon juice, until a stiff meringue is achieved. Drain the strawberries and reserve most of its syrup to use it to wet the sponge, to dissolve the gelatine and to make the frosting. Cut the cake into 3 slices and wet each slice with 2 - 3 tbsp strawberry syrup, (about 1/3 cup). Reserve a tbsp heavy cream to use in the frosting and whip the remaining heavy cream until stiff peaks form. Add the yoghurt and mix until incorporated. Refrigerate until ready to use. Wet the three pieces of cake with strawberry syrup. Remove the parchment paper from the first piece of cake and place it in a platter. Attach the ring of the pan around it and make sure to close it. Add the second piece of cake and cover it with the remaining cream. Add the third piece on top and refrigerate for at least 4 – 5 hours. Frosting: Melt the chocolate over a double boiler. Remove from the heat and with a spoon mix every now and then until lukewarm. Mix in some cream cheese and some strawberry syrup and mix to combine. Add more cream cheese and syrup and using the hand mixer mix for 2 - 3 minutes for any lumps to dissolve. Add 1 drop red food colour if you want a more vivid coloured frosting. The cake needs about two days to prepare but lots of steps can be made upto 4 days ahead.